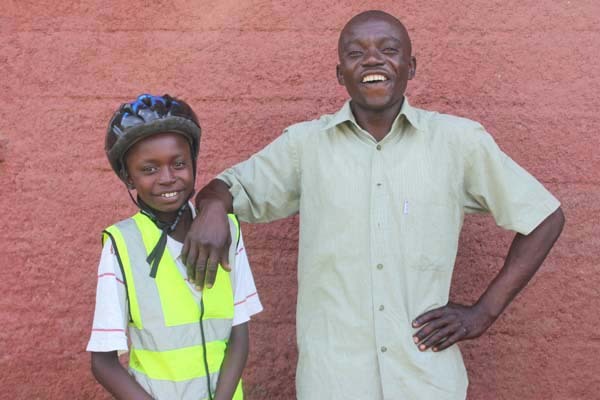 Oscar (left) is a 12-year-old who is sponsored through Unbound and has found his new passion — speed roller skating. His father, Geoffrey (right), is proud to support his son’s dream. Kenya is a hub for a surprising sport — speed skating. But it’s not the kind on ice that you might be more familiar with because of world-renowned athletes like Apolo Ohno. This is the kind on wheels that happens in bumpy alleyways and paved roads, and is growing in popularity among Kenyan youth. For kids across the globe of all ages, the ability to participate in sports from a young age provides great opportunities for learning, discipline and independence. With education at the forefront, Oscar, a 12-year-old sponsored boy in Kisumu, Kenya, was able to start speed skating as a result of the freedom that Unbound sponsorship provided him and his family. Oscar has been sponsored by Lou and Clare in California since 2012, and started speed skating in 2014. One day, he and his dad, Geoffrey, were strolling through Kisumu when Oscar spotted a group of skaters. He asked his father about joining them, and soon a conversation with the team’s coach led to Oscar’s first foray into speed skating. Geoffrey was concerned about the cost — while the coach offered a discounted rate for lessons, the gear was expensive. Oscar’s first day in training started on the grass, and he soon moved to a smooth dirt surface and then on to the paved road. In three days, he was rolling right along with the rest of the team. Geoffrey could see both Oscar’s skill and the joy beaming from him as he skated, and knew it would be worth the sacrifice for him and his wife to provide what Oscar needed to keep skating. As long as he kept his grades up, that is. Oscar is now part of a competitive speed skating team, competing around Kenya and even traveling by plane to Rwanda for a regional competition. Before Oscar was sponsored through Unbound, his parents struggled to meet the family’s basic needs of food and bedding. School fees and books seemed completely out of reach. Once Oscar was sponsored, his school tuition and supplies were covered, and the family received new beds and bedding. Since then, this help has allowed Oscar’s family to stabilize while Geoffrey continues to work as a mechanic and Oscar’s mother, Elizabeth, works as a hairdresser. Meanwhile, Geoffrey attends the support group for Unbound parents in his area, which is helping him learn how to save money to open his own garage. This venture will continue to provide for his family, and hopefully, allow for Oscar to keep skating. Geoffrey, Oscar and their family are so grateful for the support they receive through Unbound. It has not only helped to provide for their family and the children’s education, but it has created the opportunity for Oscar to pursue a new dream of speed skating — an activity that will help him flourish as he grows up. As a father, Geoffrey wants to support his son’s the dreams. Help create opportunity for a family like Oscar’s. Sponsor today.